Summer 1914, a cheerful village fete in Warwickshire is all of a sudden overshadowed by the outbreak of the First World War. Young men sign up for the Royal Warwickshire Regiment, young women join the QA Nurses. We see them in their basic training and accompany them to Ploegsteert Forest, in Belgium. It is there that the inconceivable takes its course. After days of fierce and internecine fighting, on Christmas Eve, German soldiers of the Royal Saxon Infantry Regiment 134 and the Royal Warwickshires met in No-Man’s Land and agree on a truce over Christmas. Together, they bury their dead comrades, they exchange gifts, they sing together and they play football. Phil Porter gathered these historically documented events in a new play. With tender and harsh strokes, always achieving a lasting impression, he purveys the experience of war’s pawns and makes the audience feel where ruthless gaming of politicians hits home. The set, designed by the legendary Tom Piper (the London Tower Poppies) in its fascinating simplicity, is an integral art work in itself. Sam Kenyon deserves the credit for composition and adaptation of the music. In addition to extra fine arrangements, here in particular the breathtakingly beautiful new version of the Ave Maria must be pointed out. Musical Director Bruce O’Neil and his musicians are time and again woven into the action on stage. Together with a stunning lighting design, they lead the audience on their journey. Charles Balfour’s lighting is a masterpiece, its magic creates effortless transitions through emotions and scenes. Director Erica Whyman selected a fabulous team for this play, the RSC’s 2014 family show. 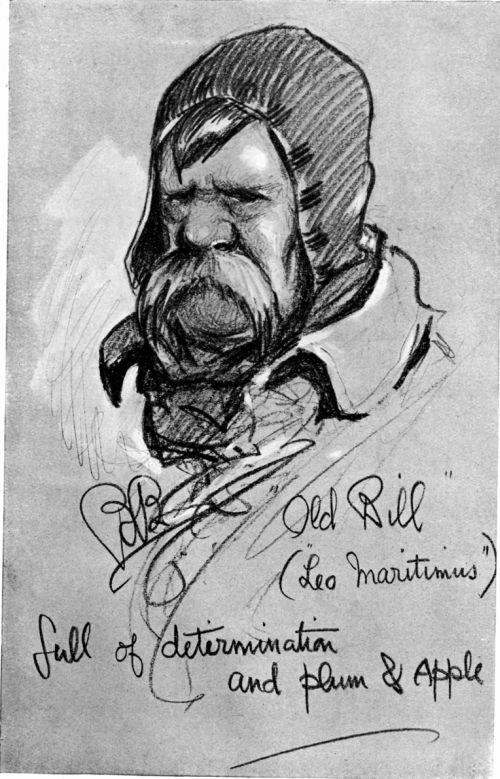 Joseph Kloska plays Captain Bruce Bairnsfather who already during the war became famous for his cartoons from the trenches. He is relaxed, sceptical and caring, and an absolute star in the frontline theatre. Old Bill is his most famous character, and here he is, part of his platoon, played by Gerald Horan, a warm-hearted walrus of a Tommy. Sam Alexander as Captain Riley and Jamie Newall as Colonel Faulkner represent the classical upper-class officers. Touching, hilarious and tragic: Oliver Lynes as clumsy Liggins, and a very special gem: the ever grumpy Private Smith, played by Harry Waller. 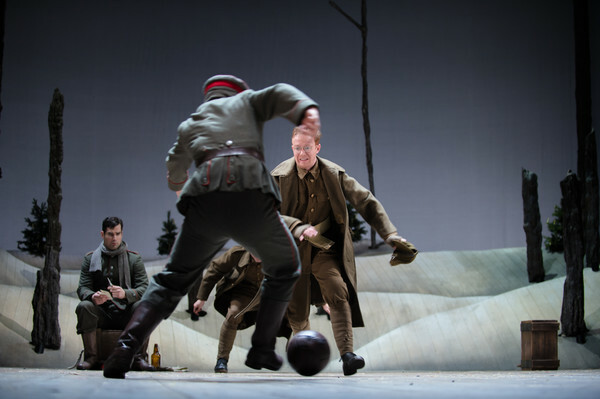 On the German side, we encounter Jamie Newall as the contact making Erich, the soldiers Jürgen: Chris McCalphy, Schmidt: Oliver Lynes and Franz: Tunji Kasim. And there is Leutnant Kohler, disillusioned by war: Nick Haverson, in a portrayal full of warmth and heartfelt depth that makes you want to go and get to know Saxony. In a blog written by a German native speaker, one thing has to be highlighted and cheered: the (nearly entirely) accent free pronunciation of the German lines by these actors. Well done! One of my favourite scenes is the moment shared between soldiers Smith and Schmidt. 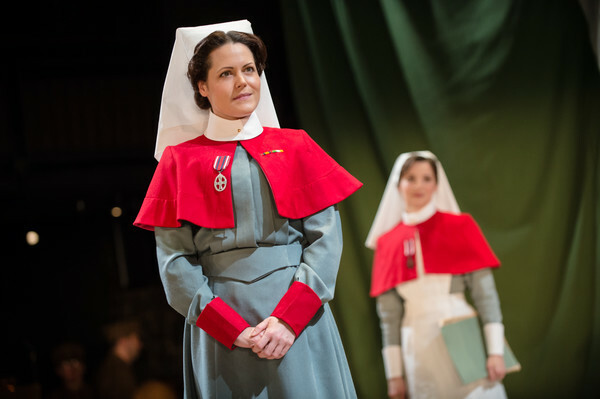 Woven in between the soldiering scenes, we find the nurses in the British field hospital. The QA Nurses Phoebe (gorgeously insubordinate: Frances McNamee), Mrs Godfrey (sweetly posh: Flora Spencer-Longhurst), Maud (Sophie Khan-Levy, who also beautifully plays a singing Belgian country girl) and Staff Nurse Peaches (the delightful bubbly Emma Manton), jointly are struggling with the fallout of war. 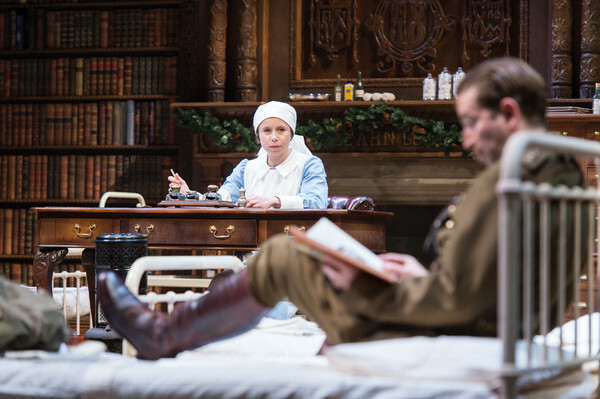 Whilst they are trying to preserve some cheerfulness, Matron (Leah Whitaker) sees a strict observance of regulations as the best support in hard times, and thus, Christmas Eve is bound to produce friction. A piece of theatre that engages the audience throughout and confronts us with the only relevant Christmas related question – about the meaning of it all. This entry was posted in Theatre and tagged Bruce O'Neil, Charles Balfour, Chris McCalphy, Chris Nayak, Emma Manton, Erica Whyman, Flora Spencer-Longhurst, Frances McNamee, Gerald Horan, Harry Waller, Jamie Newall, Joseph Kloska, Leah Whitaker, Nick Haverson, Oliver Lynes, Peter Basham, Peter McGovern, Phil Porter, Roderick Smith, Royal Shakespeare Theatre, RSC, Sam Alexander, Sam Kenyon, Sophie Khan Levy, Stratford-upon-Avon, Thomas Wheatley, Tom Piper, Tunji Kasim, William Belchambers on December 22, 2014 by lingonews. Imagine, it’s war – and nobody wants to kill anymore. 1914, first wartime Christmas: Gradually, soldiers at the front are beginning to understand that their situation has nothing to do with the lofty phrases that had inspired them in the summer. They discover that those squatting in the opposite trench are basically only human beings like themselves. British, German and French soldiers have a little respite and begin to feel the spirit of Christmas. 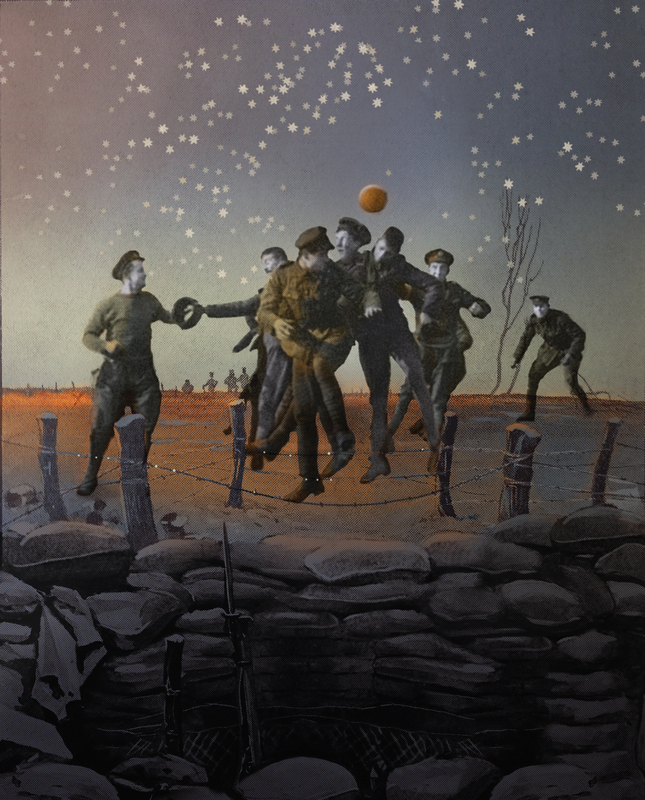 They sing carols, for each other and together, they share cake and plum pudding, they smoke together and they play football together, in No Man’s land between the trenches. On Christmas Eve and Christmas Day 1914, there was a truce at the operative level of war. Sadly, it was not to last, commanding officers of all sides thoroughly disagreed with their own potential loss of purpose. This ceasefire, however, has not lost its symbolic power up to the modern day. Someone who was there, the cartoonist Bruce Bairnsfather, spent part of his career as an electrical engineer at the Shakespeare Memorial Theatre, a predecessor of the Royal Shakespeare Company’s home. Already during the war, he began creating the cartoon series “Fragments From France” (1914) and the autobiographical “Bullets & Billets” (1916). His character of “Old Bill” became the basis of his fame. In Great Britain, having lost almost an entire generation of young men in World War I, 2014 has always been predestined to be a particularly poignant year for the commemoration of this immense disaster of humanity. 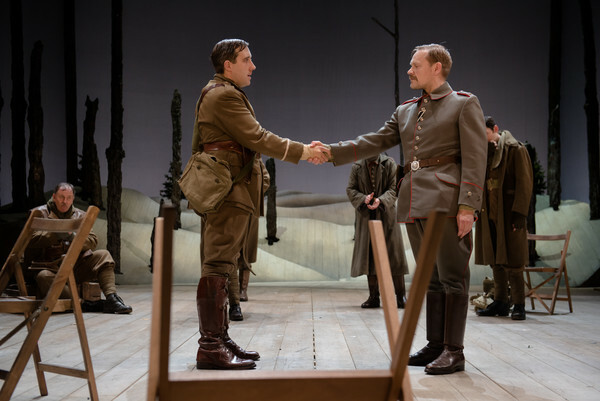 100 years after the Christmas truce in 1914, the Royal Shakespeare Company puts this victory of being simply human on the stage. 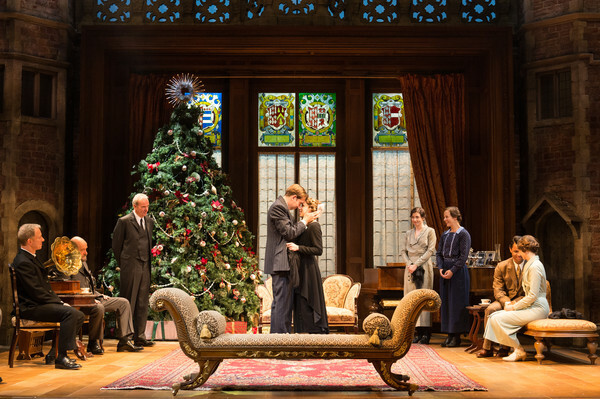 Phil Porter, an author with distinguished previous in theatre and television, wrote on behalf of and in cooperation with Erica Whyman, director and deputy artistic director of the Royal Shakespeare Company, a new play about the extraordinary events of wartime Christmas in 1914. At the front section of Ploegsteert, Bruce Bairnsfather and Old Bill experience Christmas in No Man’s land together with the “guys from the other side”. 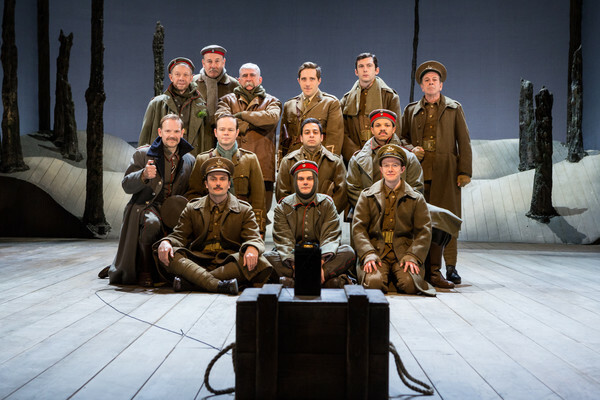 From 29 November 2014 to 31 January 2015, The Christmas Truce will be played at the Royal Shakespeare Theatre in Stratford-upon-Avon. Director: Erica Whyman, design: Tom Piper (he with the poppies at the Tower), lighting design: Charles Balfour, music: Sam Kenyon. In the UK and France, even more than in Germany, literature, films and songs were influenced by the fascination of this peace amidst all the senseless deaths. In 2005, the movie “Merry Christmas” / “Joyeux Noël“ was shown in cinemas in Germany, the UK, and in France, directed by Christian Carion and featuring Gary Lewis, Benno Führmann and Daniel Brühl. In 2006, for both the Oscars and Golden Globe awards, the film was nominated as “Best Foreign Language Film”. The French town of Frelinghien, in 2008 unveiled a memorial to the Christmas truce and soldiers of the same regiments that had faced each other at this place in 2014, arranged a new “Friendly International”. And did you know this one had the same topic? This entry was posted in Uncategorized and tagged 1914, Bruce Bairnsfather, Chris McCalphy, Chris Nayak, Christmas Truce, Emma Manton, Erica Whyman, Flora Spencer-Longhurst, Frances McNamee, Gerard Horan, Harry Waller, Jamie Newall, Joseph Kloska, Leah Whitaker, Nick Haverson, Oliver Lynes, Peter Basham, Peter McGovern, Phil Porter, Roderick Smith, Royal Shakespeare Company, RSC, Sam Alexander, Sophie Khan Levy, Stratford-upon-Avon, Thomas Wheatley, Tom Piper, Tunji Kasim, William Belchambers, World War I on November 29, 2014 by lingonews. 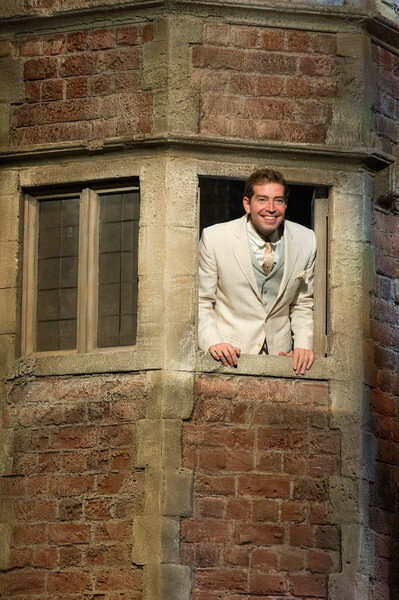 Royal Shakespeare Theatre, Stratford-upon-Avon, 03/10/2014 – 14/3/2015 Even if weren’t true, it is a wonderful idea: Shakespeare’s Much Ado as the sequel to the unsolved troubles of Love’s Labour’s Lost. The characters fit almost seamlessly, even if the names vary, and this is just the continuation one was longing for after enjoying the “first episode”. 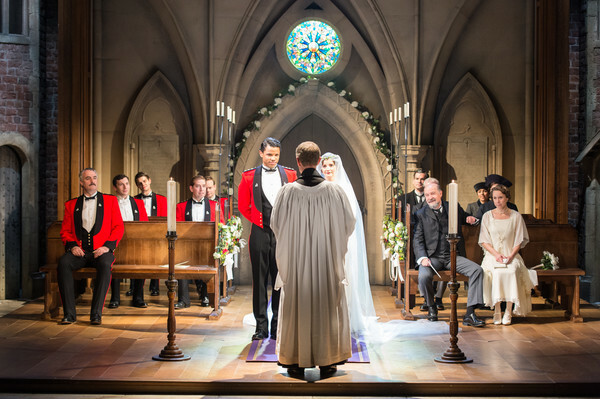 The consistency in ensemble, stage design and music rounds director Chris Luscombe’s tandem production into a bubbly romantic complete story. 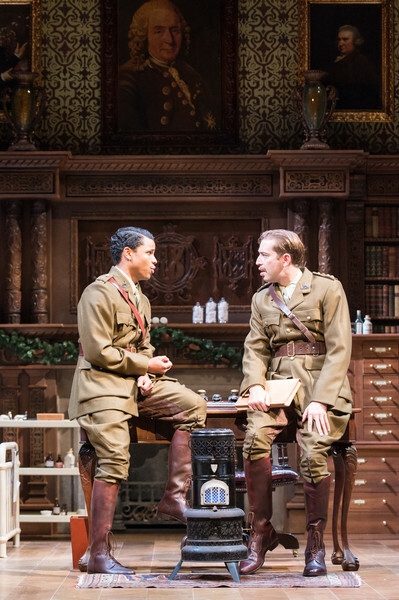 At the end of Love’s Labour’s Lost, the men went to fight in the First World War, in this, better known play, they have returned and they are trying to rebuild their lives. Kasim draws him so boyishly cute when it comes to romance, defencelessly aggressive in the play’s cruel scenes and thoroughly shaken by fate, that he becomes recognisable in the 21st century. Edward Bennet, who previously conquered the audience’s hearts as Berowne, now creates an unforgettably wonderful confused Benedick: His eavesdropping scene from behind the giant Christmas tree is a safe bet to cause sore laugh muscles. Sam Alexander, as Benedicks frustrated brother, the sinister Don John, skilfully drags the emotional waves back down to shivering suspense. However, the roller coaster effect is guaranteed: Shakespeare’s play-within-the play is gloried in to ecstasy point, the scenes with the night watch and the police station might harm the odd eye make-up. The innumerable wonderful little ideas keep generating tumultuous slapstick fun. Nick Haverson here plays the part of the yattering Constable Dogberry and he just accumulates highlight on highlight. With hilarious officious pomposity and lovingly, yet screamingly funny vulnerability, complete with a tragicomic tic, he controls the audience relentlessly – absolute master class. Many of the smaller parts shine through similar attention to detail. David Horovitch is a destroyed father-of-the-bride Leonato, Jamie Newall a fine, warm-hearted Friar Francis, Emma Manton and Frances McNamee delightfully funny ladies-in-waiting, moreover Chris Nayak as the dubious servant Borachio (fabulous RSC debut), the wonderful Chris McCalphy as Sexton, Peter McGovern, Oliver Lynes and Roderick Smith as the other watchmen and, and, and … great ensemble theatre. Balthasar, Antonio’s son, does not contribute much to the plot, Harry Waller, however, is more than that. In this part, he assumes a major musical function, singing and playing the piano. This entry was posted in Theatre and tagged Chris McCalphy, Chris Nayak, Christopher Luscombe, David Horovitch, Edward Bennet, Emma Manton, Flora Spencer-Longhurst, Frances McNamee, Harry Waller, Jamie Newall, John Hodkinson, John Woolf, Leah Whitaker, Michelle Terry, Nick Haverson, Nigel Hess, Oliver Lynes, Peter Basham, Peter McGovern, Roderick Smith, Royal Shakespeare Company, RSC, Sam Alexander, Stratford-upon-Avon, Thomas Wheatley, Tunji Kasim, William Belchambers, William Shakespeare on October 27, 2014 by lingonews. A carefree world – Four young men of noble birth, spared by all menial worries, spend their days training their quick wit and excelling in puns and rhetoric. They plan gaining a better understanding of the world by withdrawing from it. An oath of asceticism is sworn for 3 years: no pleasures and definitely no women within the castle. Shortly afterwards, four equally well born ladies make their appearance. Although they are being lodged at a certain distance, threads soon start spinning by themselves. 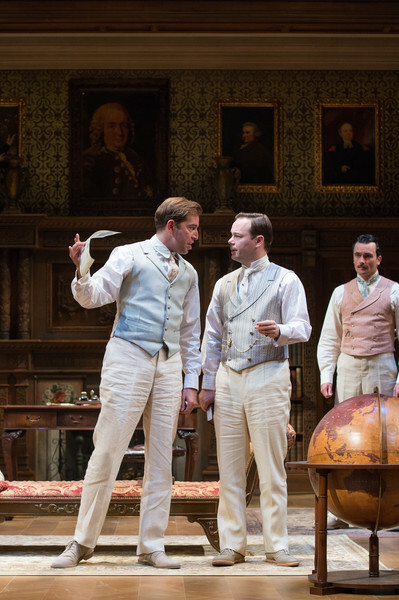 In this winter season, for the first time, the RSC shows Love’s Labour’s Lost in direct combination with Love’s Labour’s Won, long considered to be one of Shakespeare’s lost plays, nowadays, however, often assumed to be in fact the play Much Ado About Nothing. This tandem production creates a time frame around the days immediately before and after the First World War. The amazing set, designed by Simon Higlett, transports the audience to the stately manor of Charlecote near Stratford, a place well known to William Shakespeare, as it was here that he was caught poaching. The King of Navarre, played by Sam Alexander as a man of disarming naivety, is not a person to have the last word, neither with his entourage nor even for himself. Amongst his three friends, Berowne is the only one seemingly able to use common sense, however, he displays a hilarious lack of emotional intelligence. Edward Bennet owns his character. He makes him an irresistible cynic who virtually calls for a controlling female hand. Longaville (William Belchambers) and Dumaine (Tunji Kasim), just as the other two, stumble into the pitfalls of their own feelings. The four protagonists create an unbeatable highlight the turret scene, a firework display of comedy in which they make a last attempt at dissembling their enamouredness. Amongst the ladies, Leah Whitaker represents the Princess of France as a distinctly more mature and self-confident person than her male counterpart. 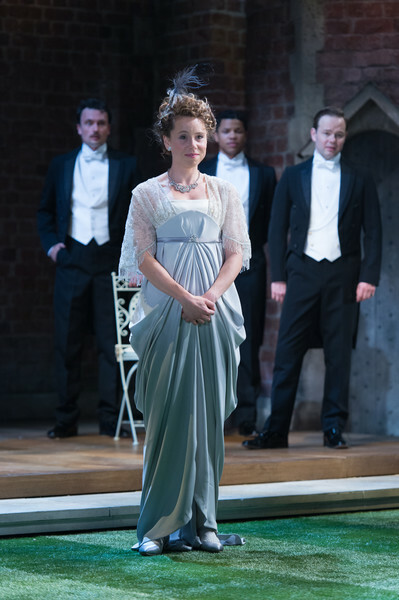 Michelle Terry, as Rosaline and thus Berowne’s flirt partner, keeps sparks flying while generating magnetism. We are allowed a first glimpse at the traits that will return with Beatrice in the “sequel”, Love’s Labour’s Won. 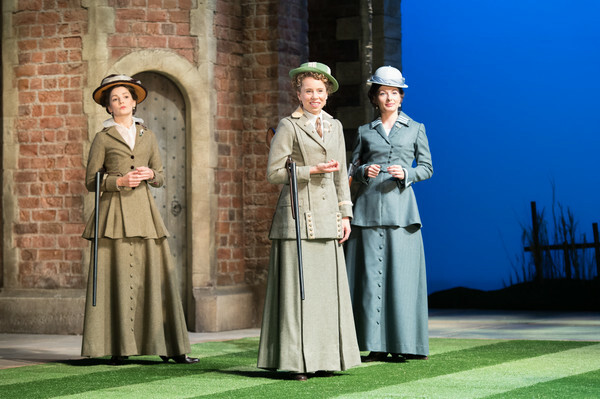 Katherine (Flora Spencer-Longhurst) and Mary (Frances McNamee), the other two ladies-in-waiting, rob the gentlemen’s senses with ease. 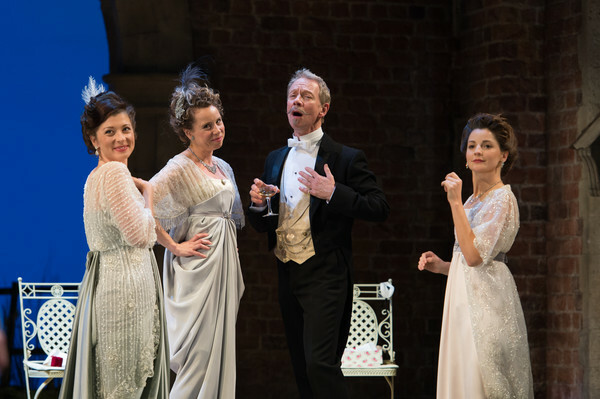 The ladies are accompanied by Lord Boyet, the Princess’s equerry (Jamie Newall, what an extraordinary voice!) and Marcadé (Roderick Smith). At less gentrified level, too, life is bubbling. Don Armado (John Hodkinson), a Spanish guest, competes with Costard, the gardener (hilariously funny: Nick Haverson) for the dairy maid Jacquenetta’s (Emma Manton, fantastic, a hothouse of energy and wit) favours. David Horovitch, Thomas Wheatley and Chris McCalphy provide the villagers’ comedy contributions. As perhaps the only fully sane person of the manor, Moth, the hall boy, Peter McGovern has a smaller part, but in this production he is the one who shapes the musical side by his singing, solo and leading the ensemble’s songs. 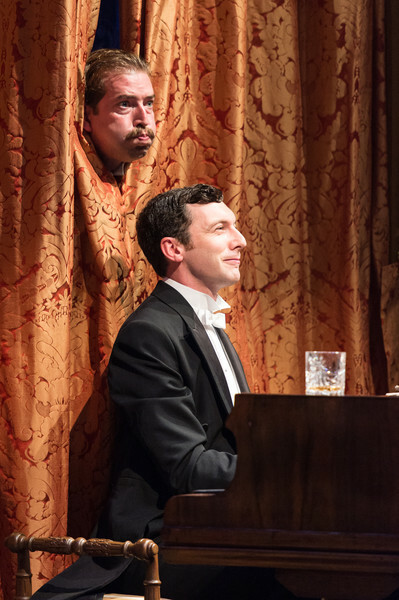 Oh the music: Nigel Hess composed a dazzling romantic musical accompaniment to the play, performed live and conducted by John Woolf, underlining and highlighting the atmosphere, a special treat in itself. A delight not to be missed! This entry was posted in Theatre and tagged Chris McCalphy, Chris Nayak, Christopher Luscombe, David Horovitch, Edward Bennet, Emma Manton, Flora Spencer-Longhurst, Frances McNamee, Harry Waller, Jamie Newall, John Hodkinson, John Woolf, Leah Whitaker, Michelle Terry, Nick Haverson, Nigel Hess, Oliver Lynes, Peter Basham, Peter McGovern, Roderick Smith, Royal Shakespeare Company, Royal Shakespeare Theatre, RSC, Sam Alexander, Stratford-upon-Avon, Thomas Wheatley, Tunji Kasim, William Belchambers, William Shakespeare on October 27, 2014 by lingonews.